These monster sandwiches are not at all scary but they are awfully cute and very yummy. How to make: Use a big round cookie cutter to cut rounds off bread slices. Use your favorite bread. I use multi-grain bread which is healthier than white and much richer in fiber. Spread butter on both slices, or butter on one and mayo on the other, or butter on one and mustard on the other. Now the trick is to get the teeth right. Use regular sandwich slices and with a knife or scissor cut out the teeth. Place the cheese teeth at the bottom, making sure the teeth are extending beyond the edge of the bread. 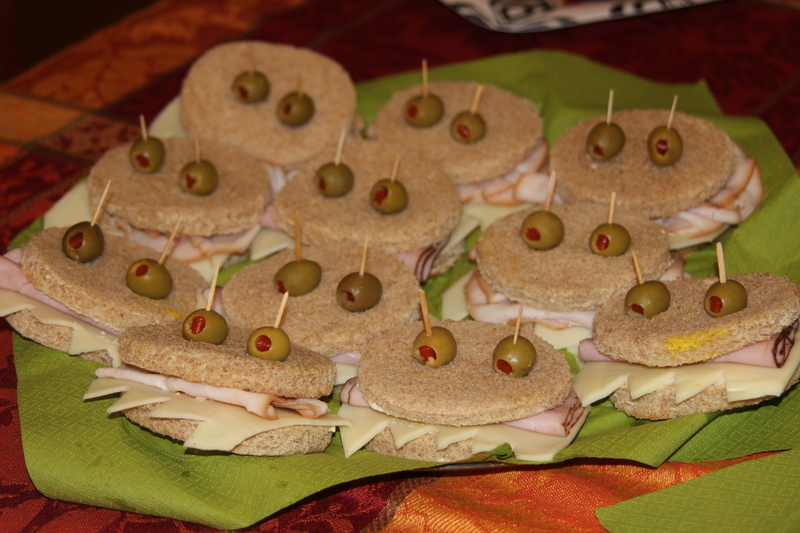 Add your favorite ham, turkey, or chicken slices and top it off with the second round of bread. Use toothpicks to fix the olive eyes of the monster. It looks better if you get the toothpick all the way but for kids I prefer the toothpicks to be in plain view.